The Sierra Nevada Corporation's reusable spacecraft, capable of carrying up to seven crewmembers, landing at spaceports and commercial airports, and autonomously shuttling cargo to the International Space Station, has passed another NASA benchmark, helping to set the stage for its first planned mission to the International Space Station in 2021. Sierra Nevada has announced that its Dream Chaser project has passed NASA milestone testing on ground and flight operation performance, including the program's mission control centre, flight computers and software and mission simulator equipment. The testing was also said to have included demonstrations of the Dream Chaser's cargo carrying capabilities using "high fidelity mock-ups of the vehicle and its cargo module, showing loading and unloading time and efficiency," according to a company press statement. — Sierra Nevada Corporation (@SierraNevCorp) 22 марта 2019 г.
John Curry, director of the SNC's ISS Commercial Resupply Services Contract 2 (CRS-2), called the testing "a great accomplishment for the team," saying it showed "we can operate the Dream Chaser from the ground, including getting critical science in and out of the vehicle." The company expects to conduct its first flight in the spring of 2021, with the plane set to make at least six flights to the ISS piggybacking aboard an Atlas V or Ariane 5 rocket to deliver equipment and supplies, returning life science and other time-sensitive materials back to Earth using a conventional runway. 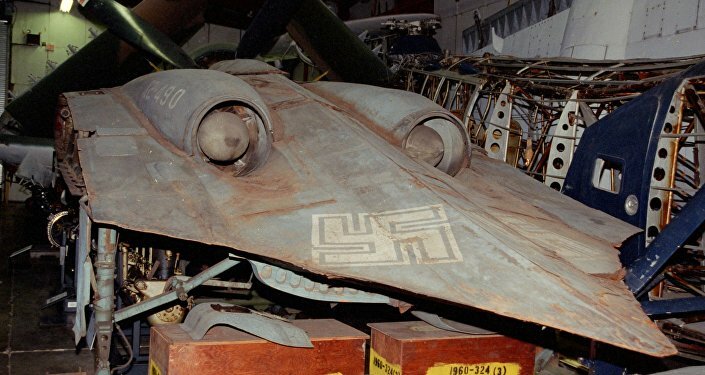 Why Did US Defence Giant Northrop Grumman Test a 75 Year-Old Nazi Proto-Stealth Bomber? Soviet scientists began development of a visually similar orbital space vehicle known as the BOR-4 (Russian acronym for 'Unpiloted Orbital Rocketplane-4') in the late 1970s, with the project initially designed to test the heatshield technology other materials for the Buran space shuttle. Four of BOR-4 spaceplanes, launched between 1982 and 1984 from the secretive Kapustin Yar rocket launch and development site in Russia's Astrakhan region, were sent into orbit, making their way back to Earth for recovery in the Indian Ocean and the Black Sea. Images of the proto-space plane were received by Western intelligence and space engineers in June 1982, after an Australian Air Force spy plane snapped it as it was being recovered by the Soviet Navy near the Cocos Islands in the Indian Ocean, with the photos quickly spreading to Western military and space-related books and magazines, including the Defence Intelligence Agency's Soviet Military Power publication. The BOR-4 itself was a continuation on an even earlier Soviet design known as the 'Spiral' orbital plane project, which was developed in the mid-1960s in response to the US's Boeing X-20 Dyna Soar space interceptor and reconnaissance aircraft program. In the mid-1980s, after US President Ronald Reagan's announcement that Washington would attempt to create a missile defence system capable of neutralizing the Soviet nuclear deterrent, Soviet engineers developed plans to place up to 15 BOR aircraft equipped with nuclear payload inside the Buran space shuttle, with the system intended to render any US missile defence system useless. In 2005, Sierra Nevada Corporation co-owner Mark Sirangelo travelled to Russia to meet with the engineers who worked on the BOR-4, telling them that their ideas lived on in the US with the Dream Chaser program. According to a 2016 Washington Post report, "Sirangelo promised that when the Dream Chaser flew, it would carry a list of the names of the Russian engineers, along with people at NASA who worked on the HL-20 program," with the HL-20 program similarly taking visual, engineering and aerodynamic design cues from the BOR-4's lifting-body shape.